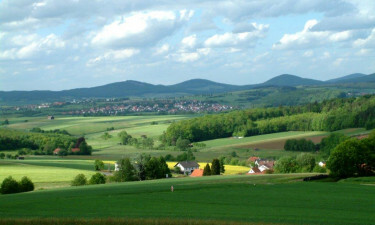 The Hessisches Kegelspiel or Hessian Skittles are nine extinct volcanoes in the Rhön Mountains. The striking landscape of rolling hills is home to this luxury camping site, providing you with a unique and inspiring setting for your camping holiday. The heart of the Rhön mountains is recognised by UNESCO as a Biosphere Reserve. This beautiful mountain range is yours to discover from the comfort of Camping Hünfelde Praforst. Book your unforgettable stay at Camping Hünfelde Praforst today with LuxCamp. Why Choose Camping Hünfelde Praforst? 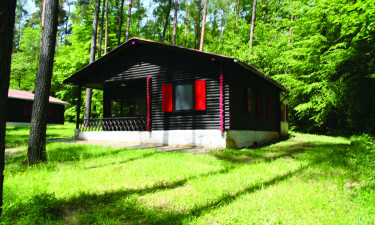 Camping Hünfelde Praforst is close to an interesting mix of nature and culture. Surrounded by striking landscapes, this luxury camping destination is close to the baroque city of Fulda. The centre of Hünfeld is only four kilometres, where you will find restaurants and shops as well as a fantastic indoor swimming pool and sauna. This modern campground offers Wi-Fi access and has convenient washing machines. 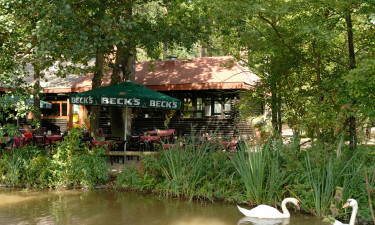 Along with cooking facilities, you can enjoy a meal or drink at the camping site’s own restaurant. You are also only 500 metres from a golf course and children’s playground. There are plenty of activities to enjoy at this holiday camping site, including table tennis, mini-golf and table football. Although it is inland, the campground has its own beach volleyball court. Scenic hiking and cycling trails are also just outside your tent or mobile home.